Rehabilitation is concerned with restoration of function and prevention of disability. In humans rehab is referred to as physical therapy, or PT. PT delivers improved function, allows patients to resume normal activities sooner, and preserves joint motion and muscle strength. So how do we apply this to pets? Well, dogs are active members of our families and our society. They experience similar injuries as humans, and similar wear and tear on bones and joints with age. 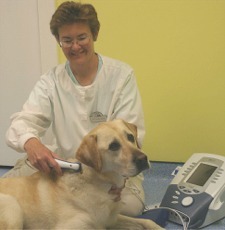 The same modalities employed in human rehabilitation are used for pets as well. Working athletes such as police dogs, search and rescue, security and assistance dogs are frequently in need of rehab. These dogs are often worth thousands of dollars, and no expense is spared for their treatment. Other dogs may participate in agility, obedience, fly ball, Frisbee, field trial, hunting, herding, conformation class or Schutzund training. All can cause injury, and all these participants need to be in excellent health to win in competition or perform well. Family pets may need rehabilitation as well. Arthritis, torn ligaments, spinal disc disease, injuries to nerves or broken bones are all common in canines. Horses are also frequent rehabilitation patients due to their athletic lifestyles. Begin as soon as possible after injury or surgery. Ice packing and therapy laser treatments can start immediately, and range of motion exercises or massage shortly thereafter. Signs a dog may need care may be subtle- slowing down, less enthusiasm to perform tasks, difficulty with turns or obstacles, not sitting squarely, or slowness getting up are all early signs of problems. Dramatic signs would be non-weight-bearing lameness, paralysis or severe pain. A pet with any of these signs may need rehabilitation. Although cats would benefit from rehab just as other patients would, they are more difficult to work with in this setting. For quiet cats that will tolerate the poking and prodding of equipment used for rehab, rehabilitation may be possible. The veterinarian performing canine rehabilitation is at a disadvantage over his or her human physical therapist counterpart for several reasons. The most obvious is that our patients can't talk or tell us where it hurts. They also don't understand what to do or not to do, so we may need to be very clever to get the patient to perform certain movements or exercises, to take it easy for a few weeks, or even to get the pet to hold still during treatments! There are also big differences in conformation - for example, the injuries a racing greyhound might get would probably be very different form those of a bulldog, and many breeds are prone to specific orthopedic problems - hip dysplasia in large breed dogs, luxating kneecaps in toy breeds, disc disease in dachshunds, for example. The sloping back of a German Shepherd predisposes to hip problems while the straight up and down knees of the Chow Chow make them much more prone to knee ligament tears. Veterinarians performing rehab on pets need to know and understand many variables between breeds and how certain activities, such as running in a harness pulling a sled, affect the body. The first step in treating a problem is to get a thorough history - what signs does the owner or handler see, what activities can or can't the dog do, when do problems occur. Then a physical exam is done, including checking every bone, muscle and joint for pain, heat, swelling, spasm or atrophy. Each joint is put through its entire range of motion, which is measured and recorded. Muscle/limb girth is also measure. Gait analysis may be done, watching the dog at various speeds going straight, in circles, and up and downhill. Reflexes and nerve function are evaluated as well. Our newest piece of equipment provides “cold” laser instead of a burning or cutting laser beam. The light waves produced by a therapeutic or cold laser penetrate gently into tissue where they affect the enzymes, cell membranes and mitochondria (the energy factories within each cell) in individual cells. It helps to increase endorphin release while decreasing inflammation and normalizing tissues. The laser beam stimulates nerve regeneration, muscle relaxation and immune system response. In a nutshell, the laser beam relieves pain, reduces inflammation, and accelerates tissue repairs and cell growth. A single treatment with the laser usually costs between $20 and $40. For some uses, such as arthritis or an ear hematoma, a client would purchase a package of 4-6 treatments for $160-240. For arthritis we would treat the pet two to three times a week for 6 treatments and then maintain the effect by treating every 3-6 weeks. The package cost will depend on how many joints we are treating. Treating an incision immediately after surgery or a single treatment of a small area can cost as little as $15. A typical rehabilitation treatment plan may include medication, therapy laser treatments, therapeutic exercise, massage, heat application and range of motion stretching. We might also refer you for chiropractic treatment or acupuncture. Treatments may be done at the clinic, or by the owner at home. Treatments may be done at the clinic, or by the owner at home. For example, a dog that is partially paralyzed after back surgery may receive therapy laser treatment before he even wakes up from anesthesia, to decrease post-operative pain and swelling. 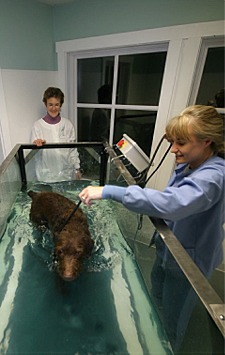 He may be exercised on a underwater treadmill twice a day to regain use of his hind legs, beginning just a few days later. Massage and range of motion exercises help keep the joints flexible. E-stim might be used to maintain muscle strength while the dog cannot use the limbs himself. A dog with arthritis might also need special exercises. When a joint hurts the dog tries not to use the leg. Reduced exercise and activity lead to muscle atrophy. The weaker the muscles, the less they are able to assist the bones and joints and the more the stress on the joints increases. This leads to a vicious cycle of deterioration. Exercise improves circulation to the joints, strengthens the muscles again and improves range of motion, restoring function and reducing pain. The veterinarian's job in rehabilitation is to formulate a treatment plan and then modify it as the patient improves: two minutes on the treadmill twice a day this week, then four minutes next week. Ten minutes of walking for the first week after surgery, then increased to 15 minutes. Therapeutic laser treatments twice weekly for 3 weeks, then once a month. Massage and range of motion exercise daily or multiple times a day for the first week. Re-evaluation is usually needed along the way. Modern day human physical therapy began in 1741 in France, in opposition to then-current methods of immobilization and bed rest. Exercise, massage and joint movement were found to help conditions such as scoliosis, cerebral palsy and various injuries. With success for these conditions, physical therapy went on to be applied to neurological conditions. In 1895 the field of physical therapy was officially launched in Britain, followed by Australia, Canada, and finally America in 1921. In the U.S. the true beginnings were treating injured soldiers in World War 1, and the field progressed through WW II and the polio epidemics. By 1961, physical therapy was the standard of care for treating patients with acute injuries, chronic diseases, arthritis, neurological injury, disc disease and spinal surgery, orthopedic injuries and problems and, of course, sports-related injuries. Nowadays, both dogs and humans benefit from rehabilitation. Better function, decreased pain and faster recoveries from surgery and injury are all achievable with therapy. Our documents are stored in PDF format. This allows you to view these documents electronically on most computers. You need to download Adobe® Reader® to view and print PDF files. After you read the first page of a multiple page document use your "back" button to return to the previous page with the list to choose the next page of the article.